Traditional retailers are panicking about e-commerce competitors like Amazon. 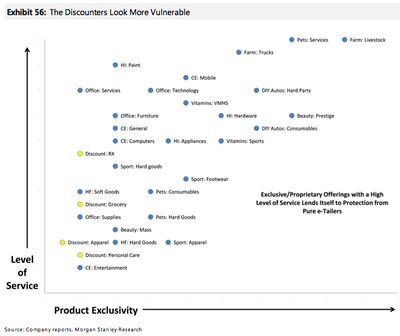 But some industries are much more vulnerable than others, according to a recent Morgan Stanley note. The analysts point out that retailers need two qualities to survive the brick-and-mortar apocalypse. 1. Exclusive products that shoppers can’t get anywhere else. 2. Customer service to help shoppers select the best option. For example, Morgan Stanley analysts don’t believe that home improvement stores like Home Depot and Lowe’s are at risk from online competition because shoppers like to see these products in person and consult with customer service associates. Retailers also need to adopt omni-channel capabilities, such as letting customers order online and pick up in stores, to succeed. Upscale home store Williams-Sonoma is named as a winner because of its unique product selection and reputation for customer service. And analysts believe Wal-Mart will continue to win because of its private-label products and low prices. The brand has also made huge progress in the online space. Discount retailers like K-Mart, Ross Stores, and Family Dollar are the most vulnerable because they offer products that shoppers can find elsewhere, leading to little brand loyalty. These brands have also been slow to adopt e-commerce. 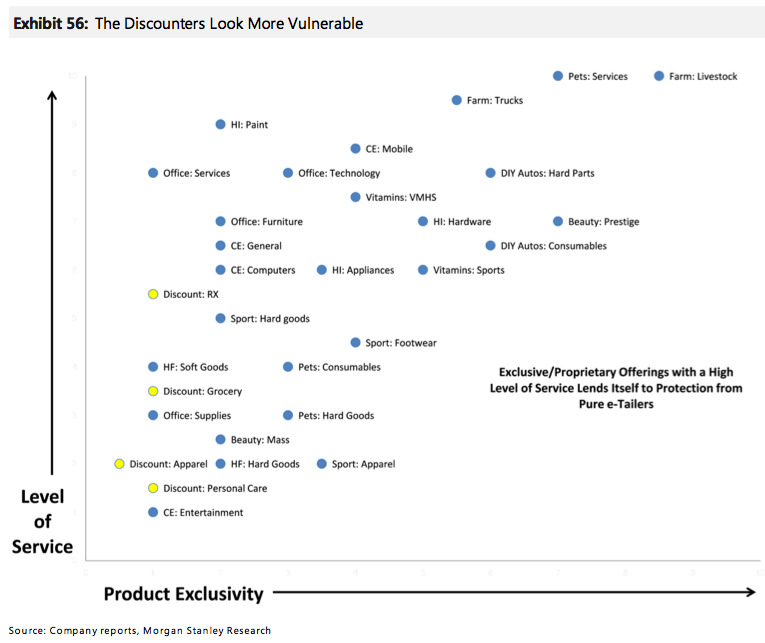 Here’s a chart showing which industries are most vulnerable to online retail. The results clearly show that discount retail is at-risk, while hardware and sporting goods stores are safe.